TomTom's MyDrive cloud service enables a number of features that will make it easier for you to plan trips and share routes and directions among your devices. One example: with MyDrive, you may plan a destination on your smartphone or computer, then send it to your TomTom in-car personal navigation device before you even step into the car. Storing device data and syncing into the secure cloud will enable third-party app and service development, and TomTom has committed to letting other developers in to play. A central cloud repository for customer's service data also permits easy updating from potential future services, such as empty parking space identification, connected services, such as a garage door set to open automatically when a vehicle is within 50 yards of home, and even self-driving cars. In the near term, the TomTom cloud will help you accurately select the fastest route, view real-time traffic information as you plan your route on your PND, and get automatic speed update warnings. 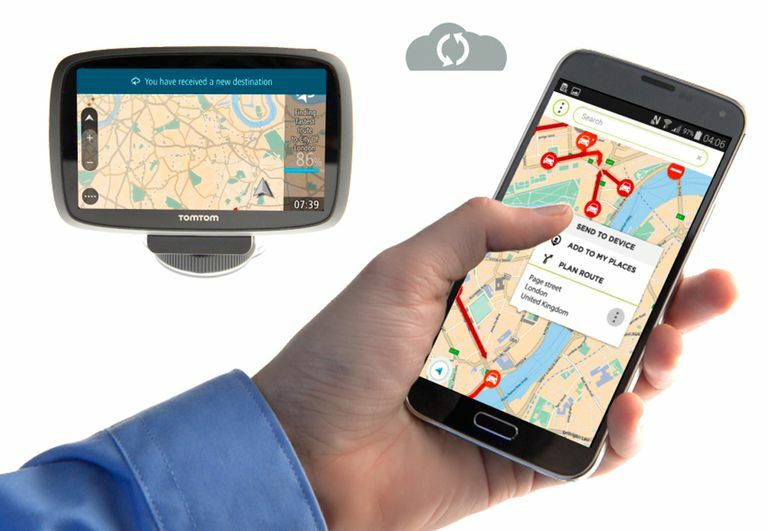 Simultaneously with the MyDrive announcement, TomTom introduced four new MyDrive-ready in-car GPS devices. The TomTom GO 510, 610, 5100 and 6100 feature a fully interactive screen to pinch, zoom and swipe – as well as a rich user interface, simplified user interaction, 3D Maps3 and a Click & Go mount. Drivers may also choose between a 5" or a 6" screen size. 1. Search for your destination on your phone or on the web. 2. Send the destination instantly to your TomTom device. 3. Your nav device will plan a route as soon as you step into the car. 4. See the traffic situation and adjust your route if necessary. 5. See your estimated arrival time. 1. Save your favorite places across all TomTom devices automatically. 2. Set home and work destinations. 3. Send custom points of interest lists to all TomTom devices. To activate MyDrive, you may update your device with the latest software, and then activate MyDrive in the TomTom services menu. "MyDrive and the new TomTom GO devices are built around NavKit. NavKit is TomTom's cross-platform navigation software that powers all navigation products we bring to market," states TomTom. "This includes Portable Navigation Devices, in-dash automotive systems, smartphone applications and online applications. NavKit provides advanced routing technology, intuitive destination entry and interactive 2D and 3D map visualisation for more than 125 countries. In repeated independent benchmarks, NavKit-powered products outsmart traffic and get you to your destination faster than any other navigation product."